The city of Bamberg is a unique place in Germany. It is about 1000 years old and since its beginning seat of a Catholic bishop. The cathedral hosts the grave of the Pope Clemens II (pope 1046 - 1047), who was actually from Bamberg. Bamberg is an outstanding example of a central European town that has grown and evolved around a Middle Age core. Since 1993 the center of Bamberg is listed as a UNESCO World Heritage Site, including more than 2400 historical buildings. The city hosts the Otto-Friedrich-Universität, which was founded in 1647 and is therefore one of the eldest in Bavaria. 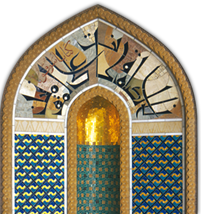 The exhibition "Religious Tolerance in Oman" was presented in Bamberg in the foyer of the faculty of Geistes-und Kulturwissenschaften on the invitation by the "Center for Interreligious Studies" of University Bamberg. 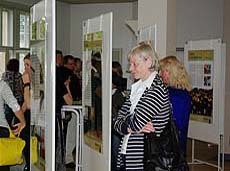 About 4000 students of the faculty, including students of theological paedagogic, saw the exhibition. The opening was celebrated by Prof. Dr. van Eickels, Dean of the faculty of Geistes-und Kulturwissenschaften together with Prof. Dr. Talabardon, Managing Director of the "Center for Interreligious Studies." 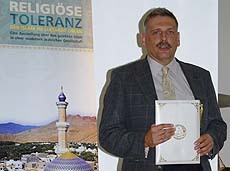 Following this, Prof. Dr. Franke, holding the chair for Islam Sciences, gave a detailed lecture about Ibadhiyah in Oman. The evening concluded by a report about an excursion to Oman of students of the University, done in March this year.